The saying goes: “If the radar on O&M starts turning, something’s happening.” And typically, that involves Dr. Don Conlee with his team of students. 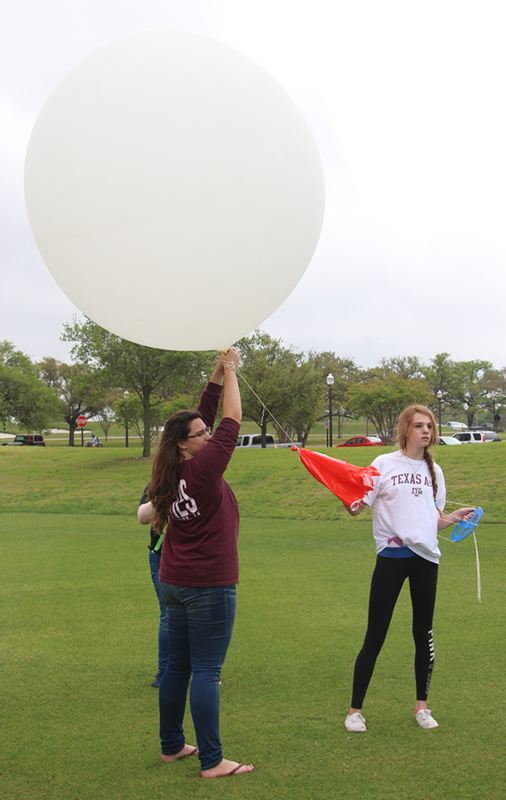 For quite some time now, Texas A&M and the College of Geosciences have worked in conjunction with the National Weather Service (NWS) in gathering local forecast data. Once Dr. Conlee is informed of a system in the area, he assembles his teams – one on the ground to set up the weather balloon launch, and another at the top of O&M that will track the balloon and gather data as it comes in. The Gulf oil spill of 2010 became a watershed moment for these launches. The NWS contacted Dr. Conlee and asked if they could conduct balloon launches at the site of the spill. “That was our first launch with equipment we actually owned”, Dr. Conlee adds. The NWS, knowing TAMU had the capability, began calling on a more regular basis. For this specific launch (March 30), Bryan/College Station happened to be on the border of the ‘slight risk’ area of an active weather system. With the storm developing, there were no sources of local data. That’s where Dr. Conlee and his team stepped in. “What we’re doing will really help them understand the boundary of the severe risk area, which falls right on top of us – where there’s no balloon unless we launch”, he explains. The weather balloon launches can have a significant impact on local forecast predictions. “They have to issue a tornado watch later. This will help them bound where that watch should go”, Dr. Conlee adds. The balloon takes approximately one hour to fly – traveling at higher altitudes than a jet. Since forecast information is so timely, their goal is to gather as much data as possible on its way up so they can quickly relay it to the NWS. Eventually, the balloon pops and the data pack parachutes to the ground. If the pack is found in reasonable shape, the team will reuse it – which also contains their contact information in case anyone discovers it. They’ve had people return them from as far away as Huntsville.